The music streaming industry is a convoluted place. The age old record companies occupy most of the copyrights, so paying licensing fees to them and building a stable business model out of it afterwards is a hard challenge. Moreover music and video streaming industries are possibly the worst victims of piracy. The role of digital piracy in the economics is kind of grey and I’m not an expert business analyst to comment on it. Rest assured, there are streaming services everywhere – battling with themselves and the pirates. Deezer is a French born music streaming service, which is becoming a big player nowadays besides Spotify or Apple Music. They tap on the market of local artists and indie original contents, thus building a steady user base. Deezer follows the ‘freemium’ model, like Spotify. Interestingly the loopholes inside the free tier were so prominent that pirates quickly started targeting Deezer to ‘rip’ high quality musics without paying a nickel. Dated back to 2014, there were few warez sites who offered downloading MP3’s directly from Deezer. 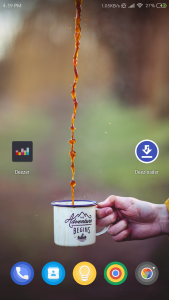 Official Deezer API is always full of vulnerabilities, and people started to build userscripts, CLI downloaders, local server emulators – even Android/iOS apps to download FLAC or 320 KBPS MP3 files of songs and albums. With that rampant piracy, Deezer changed their APIs and patched some loopholes. But those were not enough to stop the pirates. The API reversal became a challenge towards the community and multiple forks of the older downloader (commonly referred as ‘Deezloader’) were born. Groups even open sourced the forks: Deezloader Reborn, Deezloader Remaster, SMLoader, Deezloader Remix etc. became household names inside the streaming community. ZzMTV (the original author), ExtendLord, ParadoxalManiak, snwflake, m0nster are some prominent members who continued to support and maintain these forks. 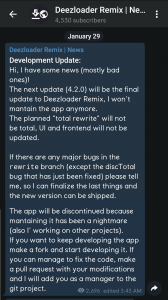 A sudden turn of events, as yesterday (29th January) the developer of Deezloader Remix announced that the next update (v4.2.0) would be the final one and subsequently the development will be seized. Users started speculating about possible DMCA takedown. Subreddits involving with Deezloader maxed out with rumors. Comment from discussion johnjohn9312’s comment from discussion "Deezloader is being replaced!". Comment from discussion dkane227’s comment from discussion "Deezloader is being replaced!". Later the developer posted another message on the Telegram channel and confirmed that no DMCA involvement was there. They wanted to get rid of the unmaintainable codebase. There was another hint about a replacement music downloader service. The new downloader should support Spotify, Tidal, Google Play Music, Qobuz, including Deezer. Curious to see if this is an actual attempt to decrypt Spotify/Google Play versus basically recording the analog output from playback. Both platforms are more likely to change up their DRM a lot if it’s a decryption. Until Deezer changes their APIs, the current version (including the Android port) should continue to work. Besides, SMLoader devs have no plan to abandon it anytime soon. Boom! Believe it or not, DMCA really came up from nowhere and tried to take it down this time. The code hoster (NotABug.org) got the takedown email from Deezer yesterday. There is an ongoing discussion between a representative of the hoster and the developer of Deezloader Remix. The tracks on their servers are encrypted by “””extremely high level encryption””” that has been cracked many years ago and they don’t bother fixing. The official repository of Deezloader Remix is still online at the time of reporting. PiunikaWeb is keeping a tab on the situation. 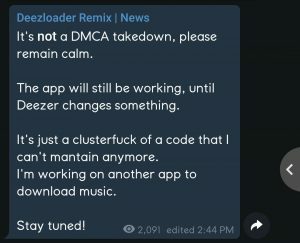 The takedown notice from Deezer didn’t explicitly mention DMCA anywhere. Moreover they did not return an answer after being queried by NotABug. We have published another article with the follow up incidents – take a look.